This is the second edition of our new ‘Focus On’ series, in which will cover the new features which BW2 have to offer. To continue this series on from our previous look at ‘The Hidden Hollows’, we will turn our attention to ‘PokéStar Studios’. [spoiler] Have you ever been to see a movie and ended up being disappointed? Relaying the version of events in your head and editing it in your mind, making it better and much more enjoyable? Well, here’s your chance to take the reign of direction in your very own movie! Moving on from the Pokémon Musicals which were introduced in Black and White, BW2 evolves this feature into something known as PokéStar Studios! 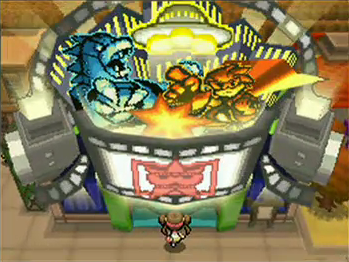 In Virbank City you will find the PokéStar Studio building. Upon entry into the building you will come across Roxie’s father, who will want you to view the debut of a new movie. The screen cuts to the movie scene, showing a battle scene where you are faced by ‘Brycenman’ – taking on the villain role within the movie – he faces the hero ‘Rioluman’ – who is played by Roxie’s father. After an exchanging of words, the villain – Brycenman, defeats Rioluman, his Vullaby knocking out Riolu in a less than cinematic plot cycle. Unfortunately the audience seem less than impressed with this feature film, their reaction not what was expected. Here’s where your directing skills come into play, as we are given the opportunity to re-record this movie! This feature allows you to direct and participate in several movie scenarios, the making of movies involving you entering into a ‘battle-like’ scenario, either with a green screen, or a character supporting motion capture attire. These green screens and characters will change form in the finished movie, and take on roles of Villains, Pokémon or newly introduced characters and monsters, which you will be expected to battle with – similar to that of a Pokémon, each having its own HP and attacks. PokéStar Studios offers various movie scenarios, each introducing varied dialogue and scripts for you to choose from which will help shape the finished product of the movie. The choices of script in which you choose will depict the direction in which the movie progresses, and alters events in which happen within numerous cut scenes. Your finished creation will include an animated location background which will be relevant to the movie, including animated cut scenes of dialogue to shape and tell the story, as well as showcasing the battle which took place and bringing to life the green screens etc. You will be expected to use rental Pokémon at first – Pokémon that are relevant to the movie – but once you’ve cleared a movie, you will be able to re-record it using your own Pokémon. As well as the newly cinematically hyped up Brycen(man), PokéStar studios lays prelude to a whole new host of monsters and characters, introducing villains such as ‘Strange Lady ?? ?’, ‘Guardian Plushie’, ‘Magic Queen JuJube’, ‘Invader Alien’, ‘Mysterious Light’, ‘Ledian of the future’, ‘The UFO’, ‘Time Machine’ and ‘White/Black Door’ to name but a few! And of course not forgetting the unofficially dubbed mascot of the studios – the robotic Tyranitar – known as ‘M.B’. Another awesome feature, is the ability to be able to make your Pokémon a ‘star’. Once you have finished a movie using the rental Pokémon provided, you are then able to use your own Pokémon in each completed movie. Each movie has a mission, if you manage to complete these missions, altering the script so that the movie is distorted and out of context, the movie’s ending will be warped. The Pokémon in which you used will become a ‘Star’ and it will have a bright yellow star upon its head when it enters into a battle – similar to that of ‘seals’ which were used on Pokéballs in Generation IV. What do you guys think of PokéStar Studios? Do you think this substitute for the Pokémon Musicals is a step in the right direction? Do you guys take part in these ‘sub-games’ or do you bypass them, continuing on with the main game? We want to know!